I hope you all had a wonderful Thanksgiving! Ours was busy, but fun. We had my husbands family over, including my sweet nephew, his wife and their twin baby boys from California. It was so nice to visit with everyone, meet the new babies, and of course, eat all of the delicious food! And now that Thanksgiving is over, I’m on to preparing for the next holiday: Christmas! Hubby and I spent most of yesterday packing up all of the fall decor, and pulling the Christmas bins out of the garage. We have the tree(s) up, and we’ll finish putting on all of the ornaments today! I’m going with the same “natural” theme I decorated with last year. I’ve been able to purchase a few new things to add, and make a few more. 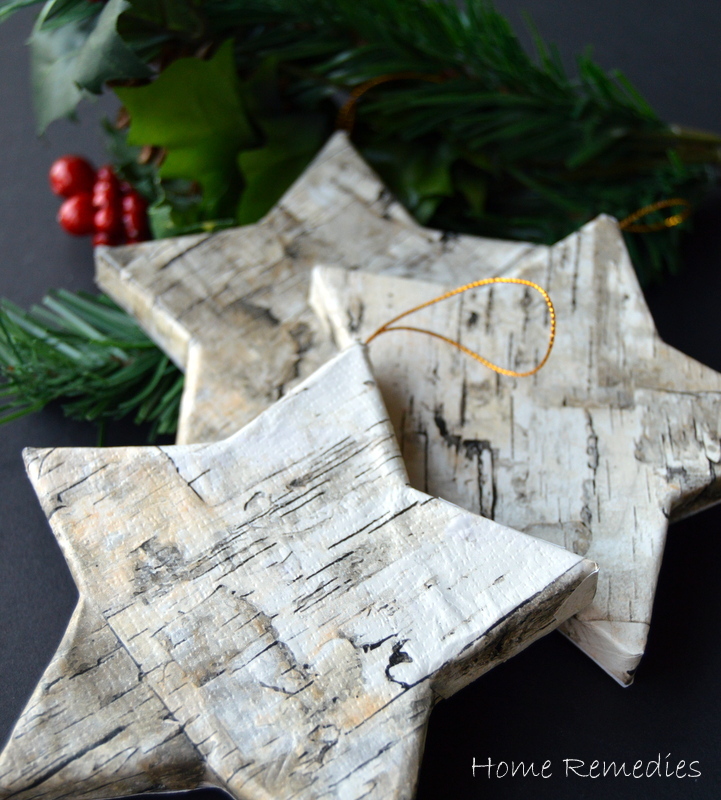 Today I’m sharing one of those handmade projects with you; How To Make A Birch-Bark Ornament – The Easy Way. 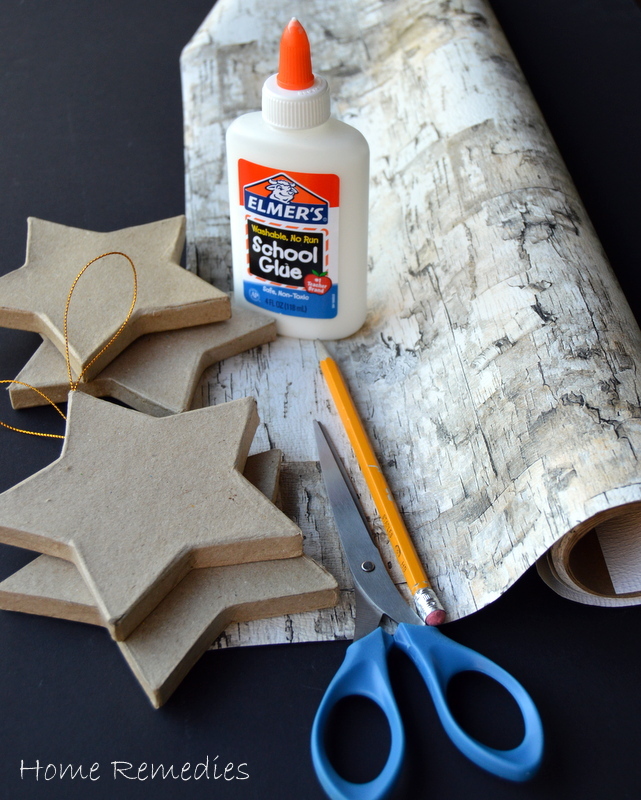 Supplies needed: Birch paper – you can use wrapping paper, like I did (Pier One has this paper in stock right now), or scrap book paper. 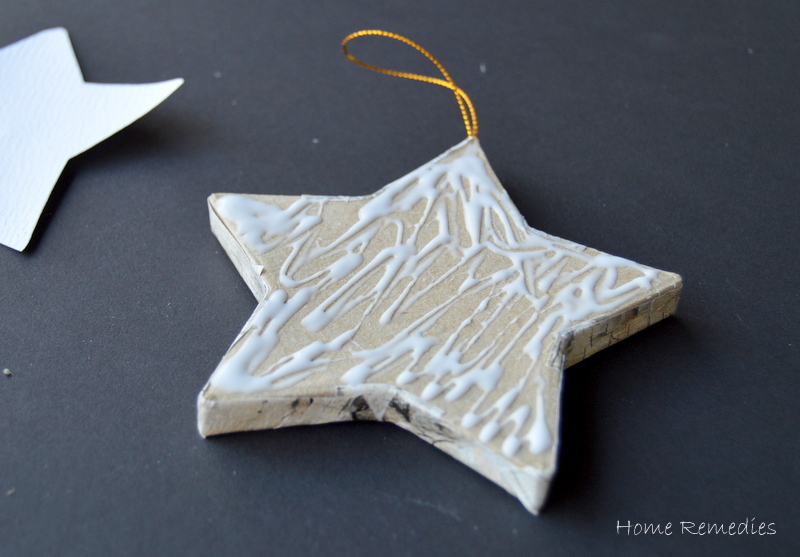 Trace the paper mache star onto the back side of the wrapping paper, leaving a 1/2″ gap between the shapes. Cut out your wrapping paper stars – cutting one star on the line and leaving a 1/2″ margin around the other star (see pic). 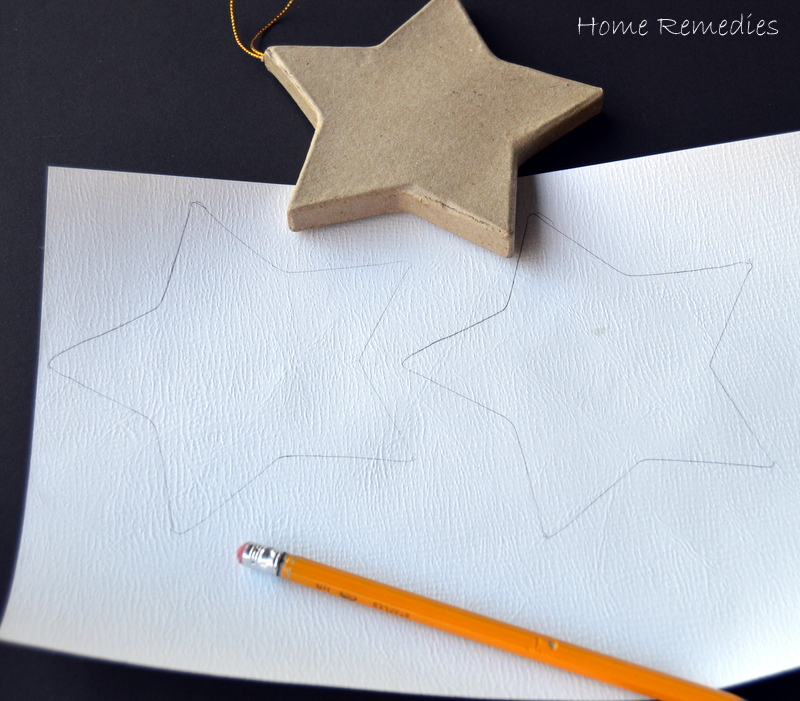 Cut slits into the margin of the larger wrapping paper star at all points and angles – careful to cut only up to the pencil line. 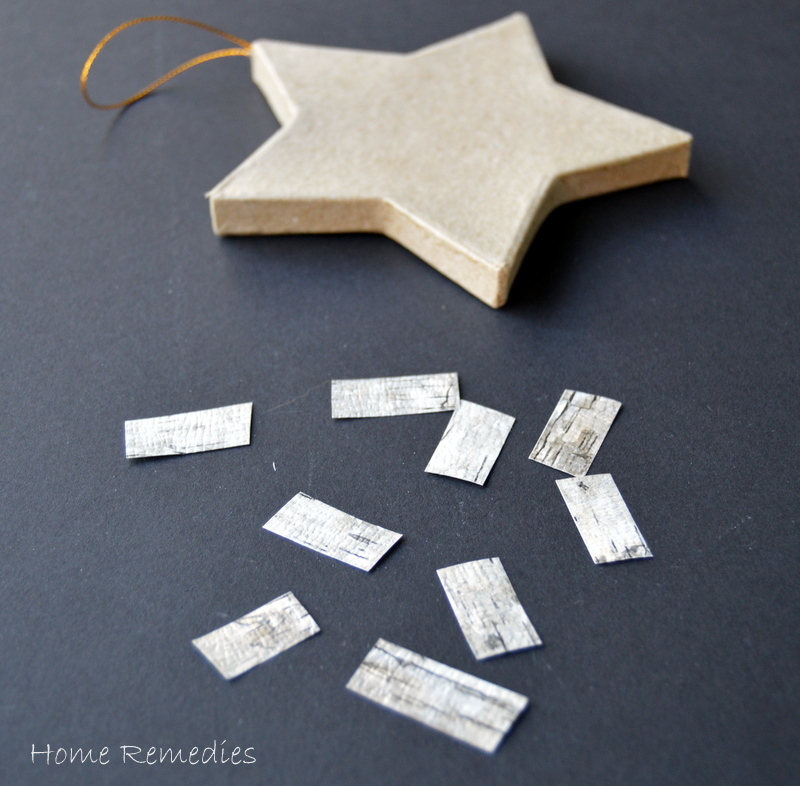 Using paper scraps, cut little strips into 1/2″ by 1″ pieces (you will need five pieces per star). 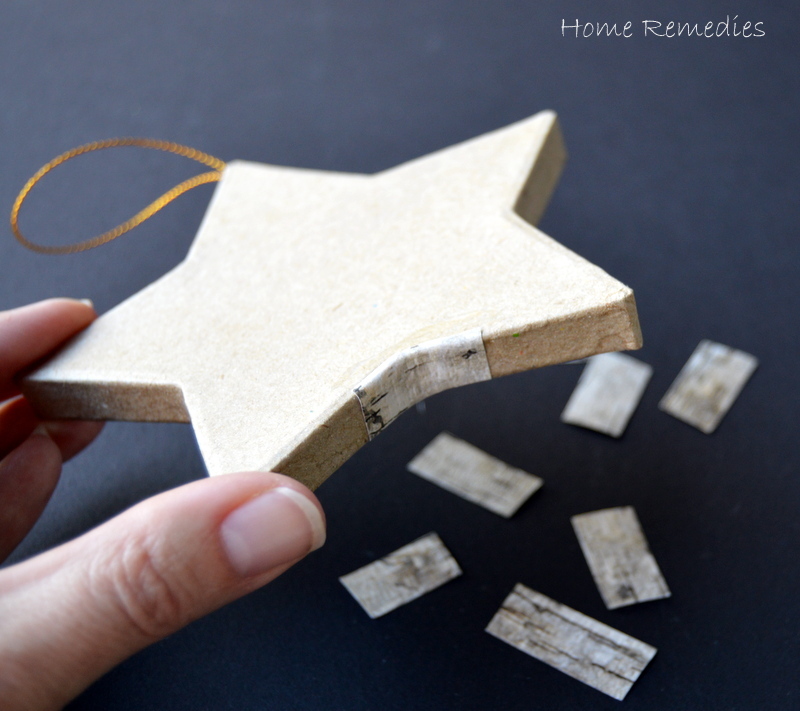 Glue the strips of paper onto the paper mache star – one at each “angle”. 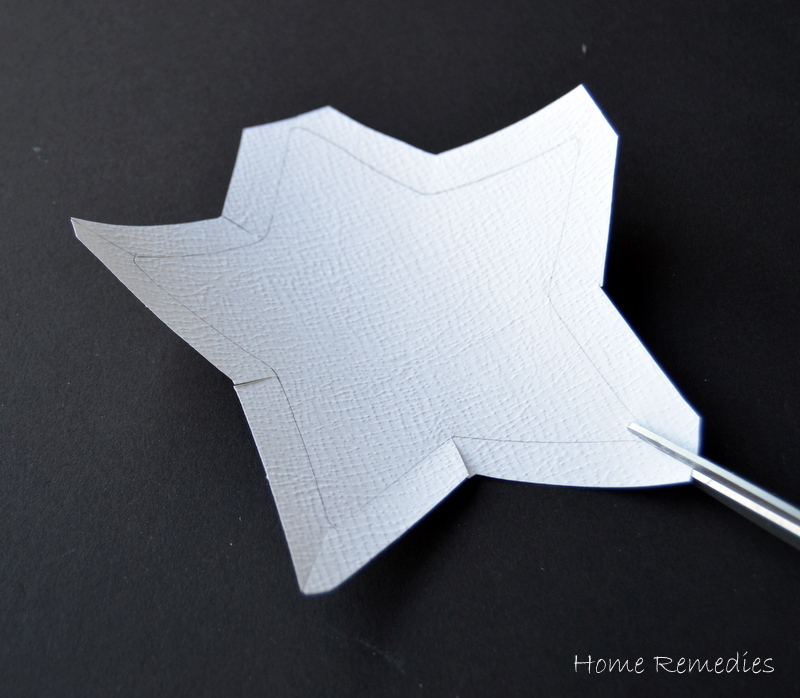 Spread glue onto one side of the paper mache star, then place on top of the larger wrapping paper cutout. Press firmly to assure adhesion. 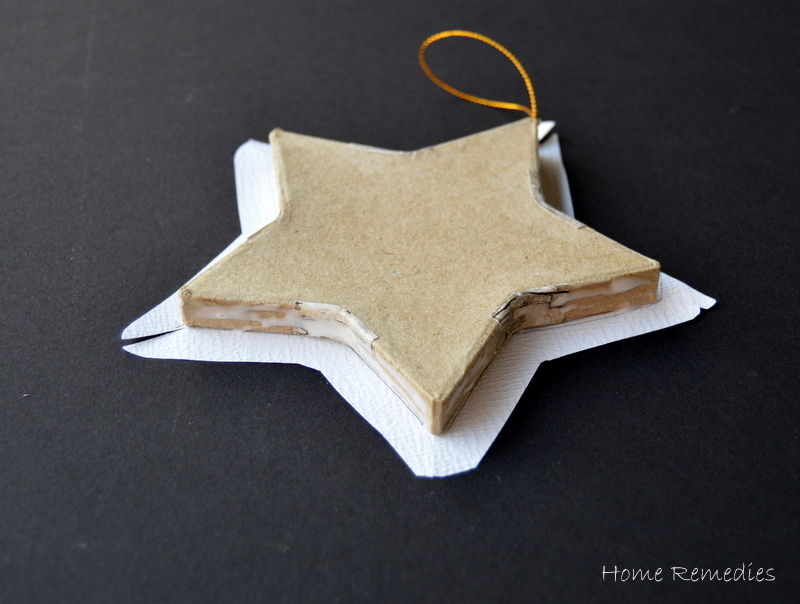 Spread glue around the edges of the paper mache star and fold the wrapping paper over, pressing firmly. 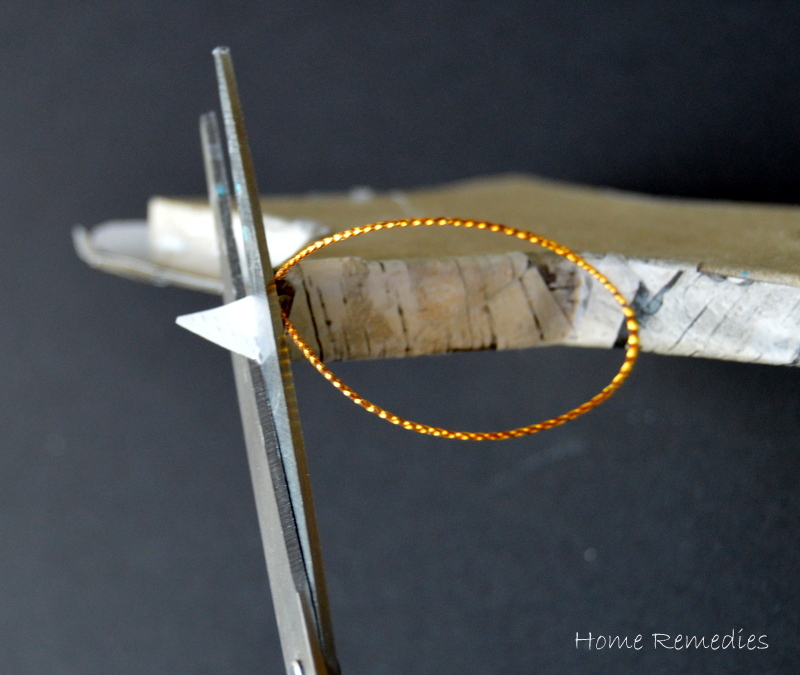 Trim the wrapping paper carefully around the hanger. 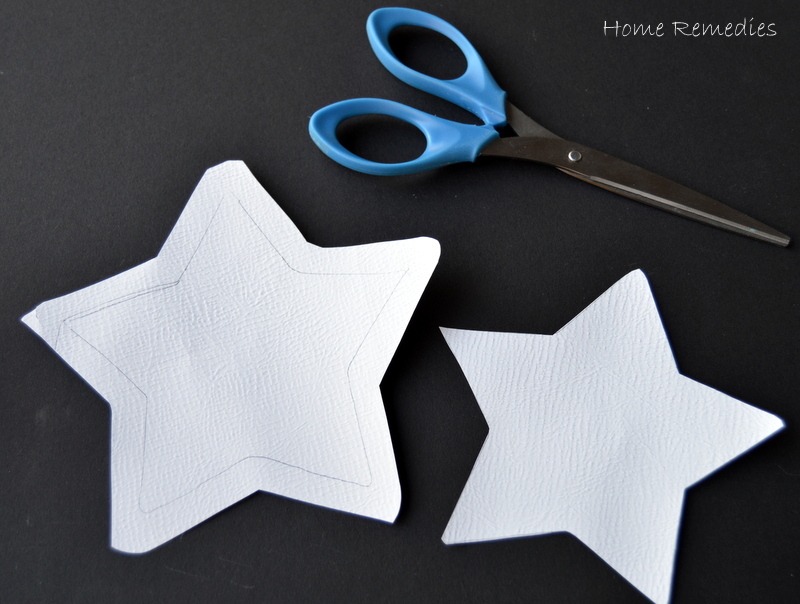 Glue the smaller wrapping paper star cutout onto the paper mache star. 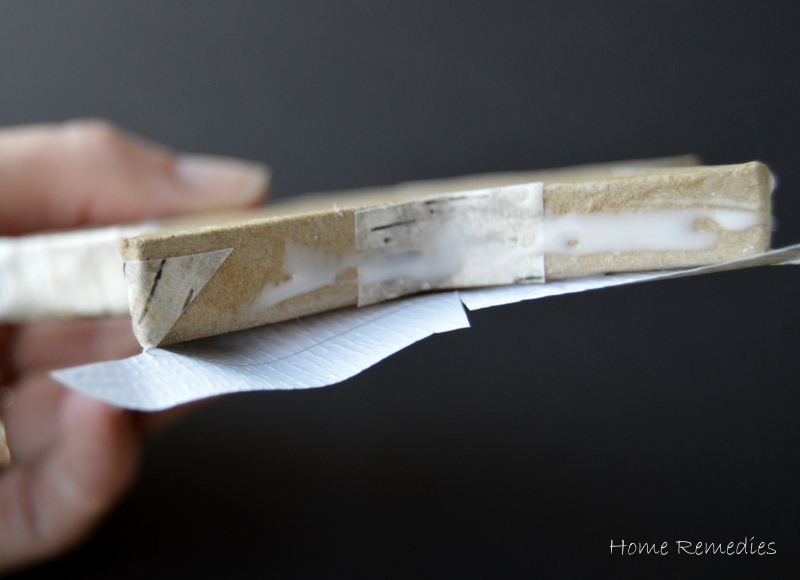 Press all edges down firmly and trim any “overhanging” paper, if needed. 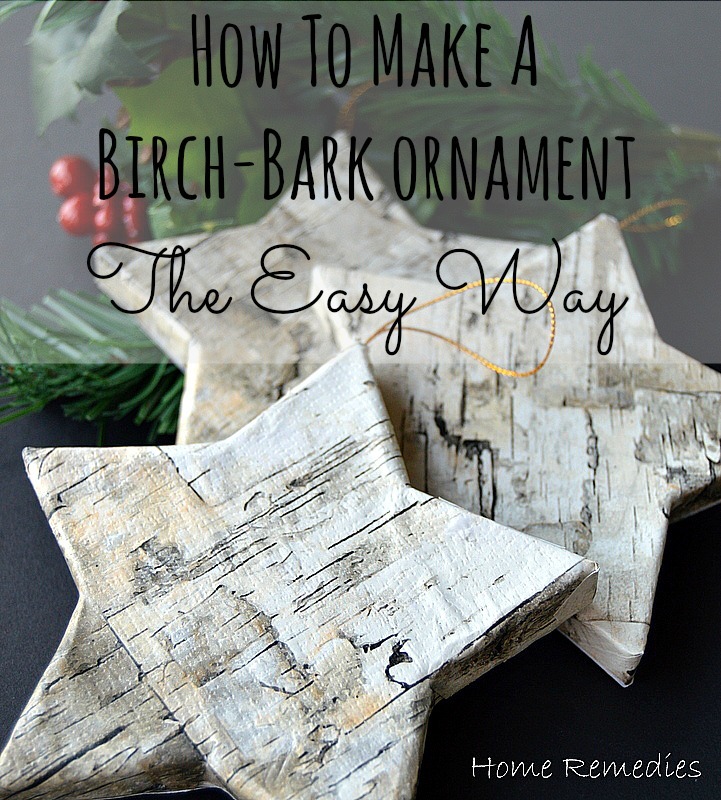 And there you have it, Birch- Bark Ornaments – The Easy Way. 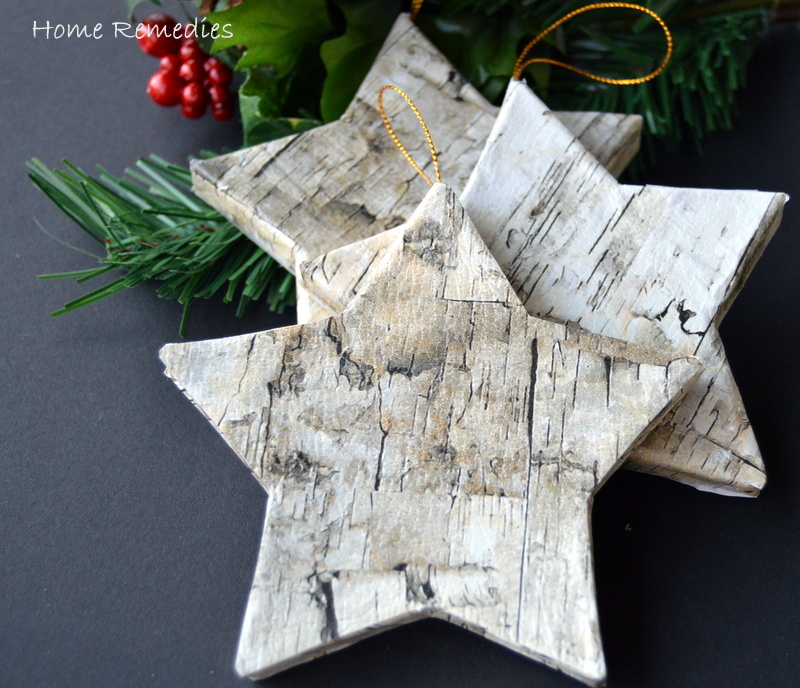 Now go hang your birch bark ornament(s) on your tree, and enjoy! 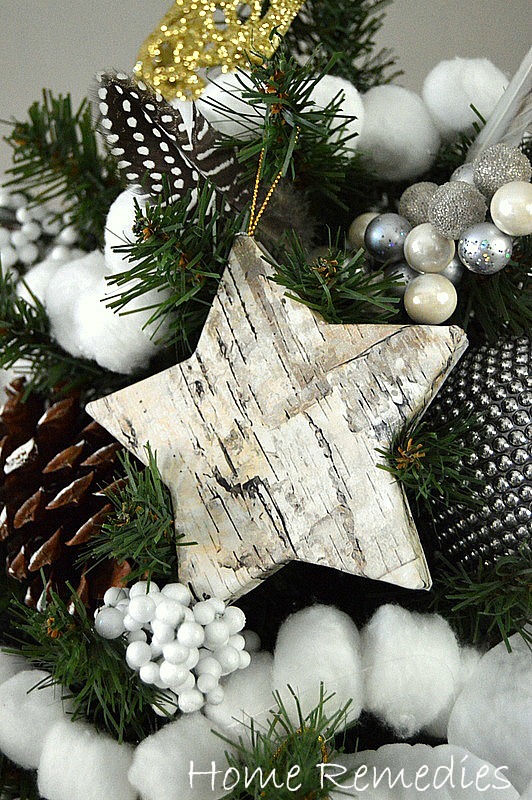 Which do you prefer, handmade ornaments, or store bought? 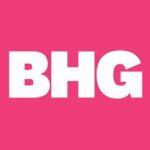 Connect with me on FB, Instagram and Google +! CUTE! That paper would make neat candle holders, too! Thank you Katie – candle holders are actually my next project! So glad you stopped by! These are really cute! So bummed I was just at Pier 1….guess I’ll be making another stop! They had tons of it when I was there over the weekend! Good luck with your project, and thank you for stopping by! These are gorgeous! I need to find some of that paper! Thank you Ginnie! Homegoods (in my area) hasn’t had any more, but I recently found it at Pier One Imports. Good luck! These are lovely! I had no idea they were paper at first. I have a roll of barnwood paper in my craft stash. I think you might have just inspired me to try out a few ornaments myself. 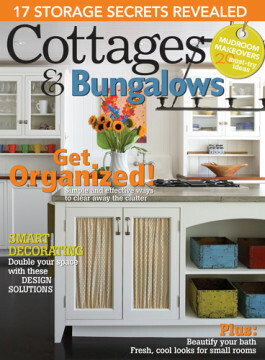 Barnwood would look awesome! 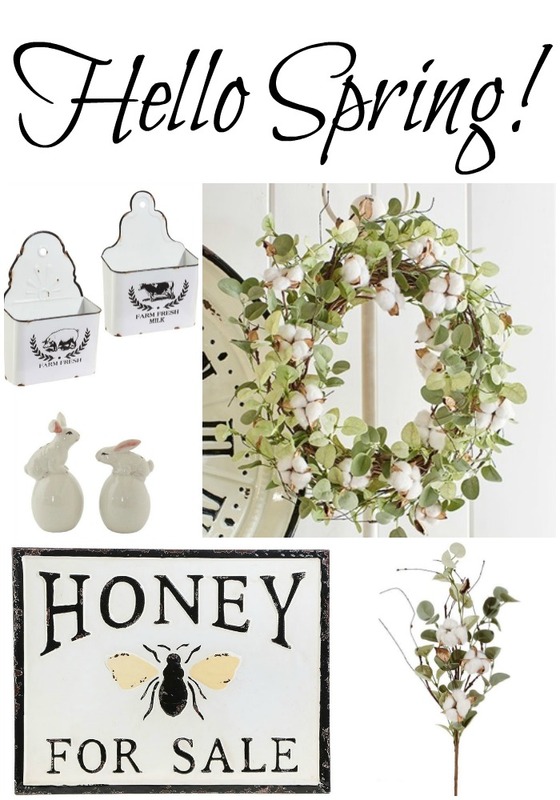 This is such a quick and easy project, too! Thanks so much for stopping by! These are so creative!! Love them! Thank you, Alice! They were fun to make and really helped fill up my “naked” tree! Thanks so much for stopping by! LOVE this idea! Your ornaments turned out beautifully! Thank you, Bre! They were so much fun to make! I am dying over how cute these are! I need to make some now! Thank you, Kristen – They were so fun (and easy) to make! So glad you stopped by! LOVE this ornament! That wrapping paper looks very authentic! Jennifer Juniper recently posted…A 16 Year Old! Thank you, Jennifer. 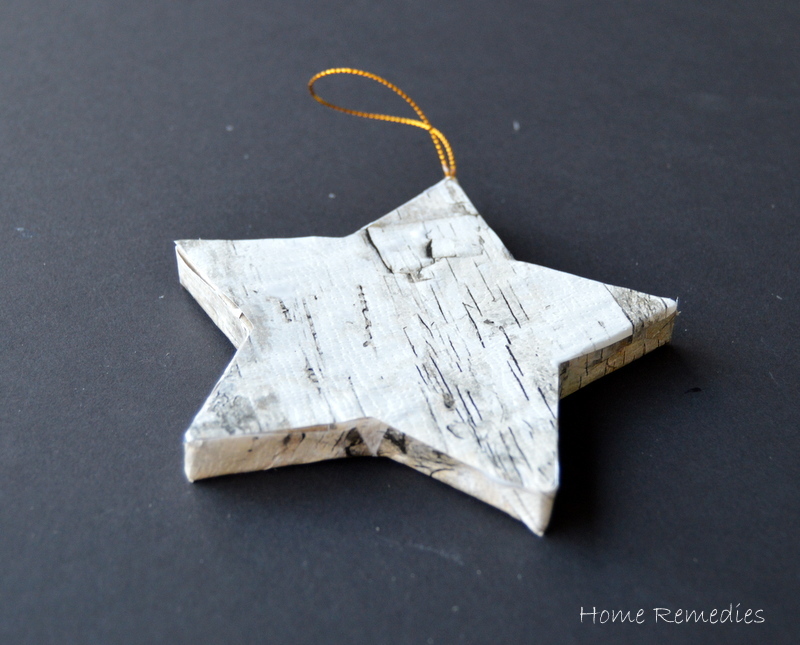 It was an easy way to add more “rustic” ornaments to my tree! I could have sworn that you used real birch bark on these! They look so pretty and professional. The ornaments are just gorgeous! Thank you, Jamie! That wrapping paper is probably my favorite find of the season! Thank you for stopping by! 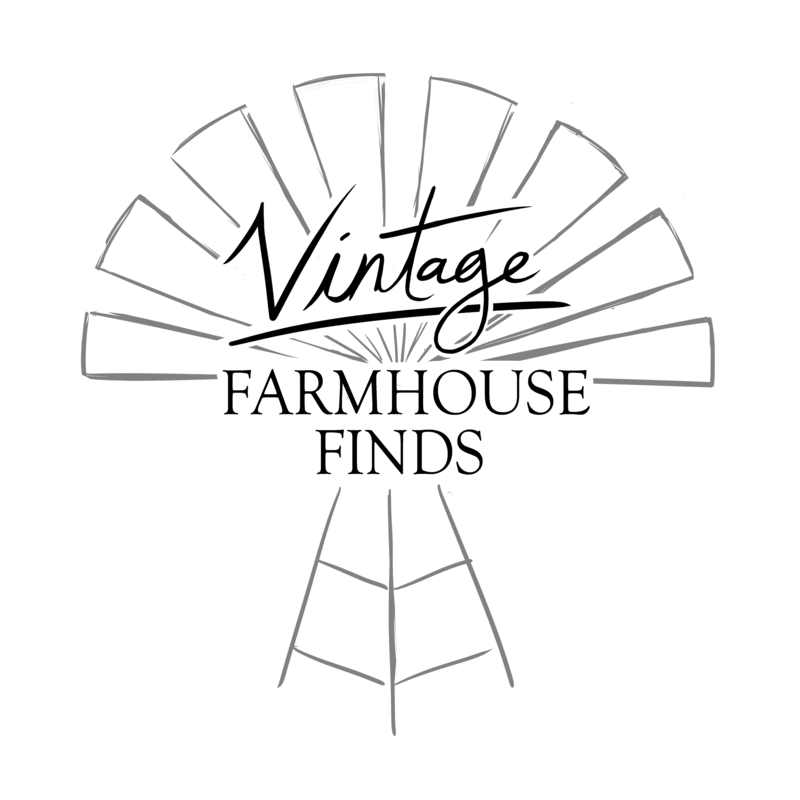 Thank you Marti – it was such a fun project to do! I’m so glad you stopped by! GREAT idea, I love these! Love!! Pinned, the look so real! 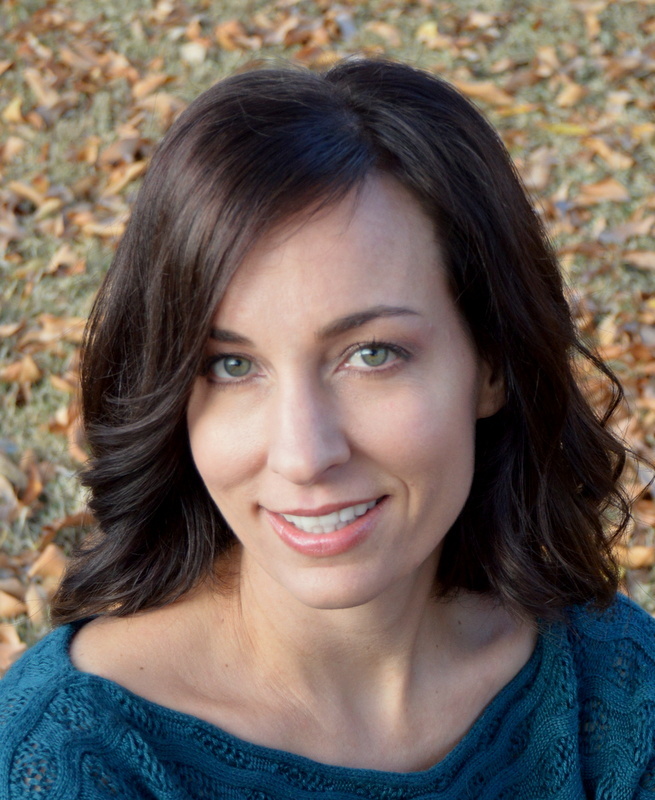 Mindi recently posted…I. love. Chalkboards. Holy cow these look like the real thing!!! Wish I had more time to whip some up before Christmas Thank you for sharing them at On Display Thursday, they’ll be one of my features tomorrow!! Those are so cute, I love them. Beautiful touch on your tree too.